Once upon a time, Harley Jessup worked on Twice Upon a Time. 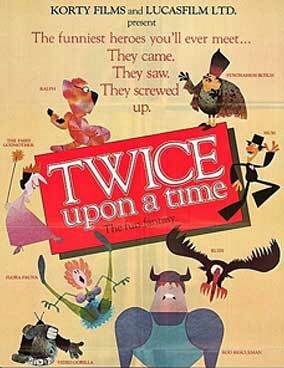 And while this John Korty film would eventually go on to achieve cult status, when George Lucas' first attempt at creating a full length animated feature went into limited release back in August of 1983 and then quickly faded from view, this then-29 year-old character designer decided that he was swearing off animation. "Don't get me wrong. I have great memories of working on Twice Upon a Time. It's just sad that it didn't get much of a release," Jessup recalled during a recent phone interview. "Of course, you have to remember that -- back in the early 1980s -- animated features were a rare thing and not always popular." "Anyway, after Twice Upon a Time, I vowed that I'd never work in animation again. It was just too hard. It was not rewarding. For me, anyway," Harley continued. "So I then decided to work in visual effects for live action films instead." This turned out to be an extremely smart move on Jessup's part. Given that -- within just two years time -- Jessup would win an Emmy for his effects work on The Ewok Adventure, a Star Wars-inspired TV movie that Lucasfilm, ltd. produced for ABC Television. And then in 1987, Harley won an Academy Award for his visual effects work on Joe Dante's science-fiction adventure-comedy, Innerspace. So with his career path seemingly set as a visual effects art director, how did Jessup wind up as the production designer of such hugely successful Pixar Animation Studios films as Monsters, Inc., Rataouille, Cars 2, and The Good Dinosaur (which is being released on Blu-ray & DVD today)? The answer lies with Twice Upon a Time. Or should I say with another Twice Upon a Time survivor, one Henry Selick. 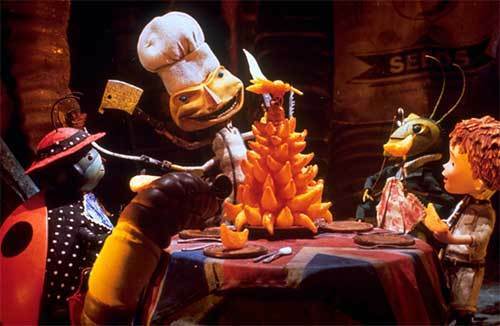 Who -- on the heels of the success of 1993's The Nightmare Before Christmas (which Tim Burton conceived and produced but Selick actually directed) -- wanted to make another full length stop motion animated feature. This one based on a classic Roald Dahl story. 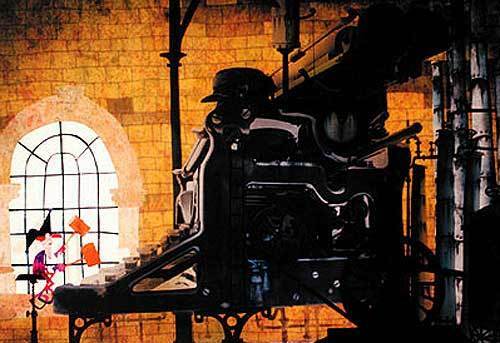 More to the point, Henry wanted Harley to be this film's production designer. "And that's honestly how I got back into animation, by working on James and the Giant Peach, Jessup stated. "And then ... Well, it was all my experience with working in live action and with visual effects and stop motion that really helped me here at Pixar. Because it's a 3D world too. Just like with stop motion. Except that here we have to create everything that you see on the screen." And speaking of creating, The Good Dinosaur presented a number of production design challenges to Harley and his team. Given that this Peter Sohn film was simultaneously a western, a road picture and an heartfelt boy-and-his-dog story that just happened to be built around an 18 foot-tall / 11 year-old apatosaurus and a feral but friendly caveboy. "Getting all of those story-based Venn diagrams to line up was really a challenge. But at the same time, it was exhilarating. Because of all the preliminary work that we were doing on The Good Dinosaur, you could just see that this story was going to be strong once it got up on screen. People here were really excited by Pete's vision. 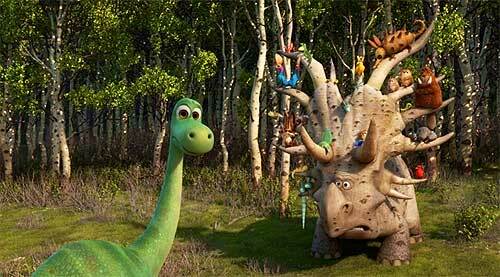 Putting these dinosaur characters in a western frontier environment," Jessup enthused. 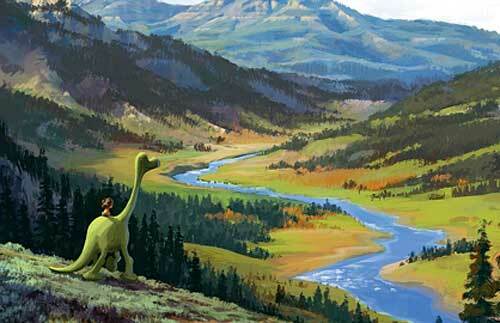 Which isn't to say that coming up with a workable production design for The Good Dinosaur was easy. Harley and his team especially struggled as they were coming up with a workable / sensible / believable design for the rough frontier home that Arlo & his family occupied. "Given that these dinosaurs were supposed to be settlers ... Well, this house had to look like they themselves had built it by pushing huge boulders together or by pulling down big trees and then laying them on top of that rough rock foundation. That was one of the main challenges of this movie. And at certain times, I really yearned for these dinosaurs to have hands," Jessup laughed. "We also had to figure out how Arlo's family built the fence that circled their farm and kept wilderness creatures like Spot at bay. Again, I really wished that there was a way for a dinosaur could lash a fence together. But eventually we came up with a solution by having Arlo's Dad & Mom pushing things into the ground," Harley continued. "Yes, these were character-driven limitations that we had to find ways to work around. But in the end, I think it was those limitations that wound up making The Good Dinosaur look so unique." 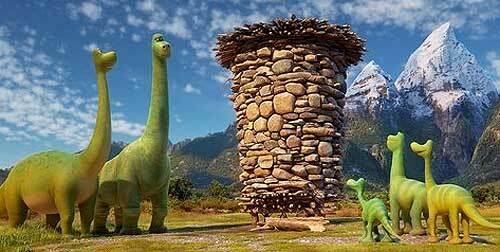 And speaking of this film's unique look, there were those at Pixar who were initially kind of concerned with Sohn's decision to place The Good Dinosaur's very cartoon-y characters in hyper-detailed / very realistic natural settings. "Admittedly that was a chance that we were taking with this film. And I have to admit that I was kind of holding my breath at the very beginning as we were doing the initial tests to see if this pairing would in fact work. Because it's very counter intuitive in a certain way. From the early days of Disney Feature Animation to today, it's always been 'Try to integrate your characters as much as you can with your backgrounds,' " Jessup said. "But me personally, I feel that contrast help. Especially when it makes it easier for the audience to discern Arlo, to find that character within some of the big environments that we created for The Good Dinosaur. Thanks to Arlo's cartoon-y design, we could pull the camera quite a bit further away. Because of his bright green color, you could still see him on a mountain ridge. That then allowed us to use David Lean-like, Lawrence of Arabia-style cinematography in several scenes. Which was fun to design around." And speaking of classic films ... To help inspire the artists & animators who work at Pixar, this animation regularly holds screenings of a wide variety of movies for those who work on the Emeryville campus. And over the past year or so ... Well, let's just say that Harley was both surprised & pleased when he heard that one particular animated feature was going to be screened in the Steve Jobs Theater. 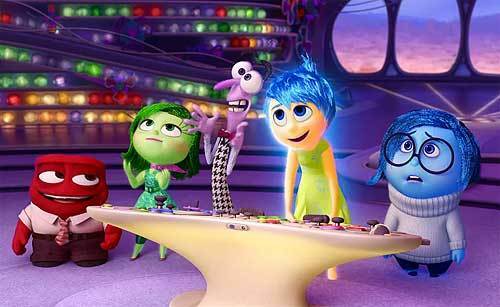 "While Pete Docter's team was working on Inside Out, Ralph Eggleston had them watch Twice Upon a Time at a certain point. And I thought, 'Well, that's nice.' That film lives on in odd, different little ways," Jessup smiled. "Looking back on Twice Upon a Time now ... Again, I'm sad that it didn't get much of a release then back. But I still really value my time on Twice Upon a Time because that's the movie I learned the fundamentals of the animation production process on. How you have to take a promising story idea first through the development process, then through preproduction and then finally put into production. That's the movie where I learned how to work with a team, how to be part of a collaborative process. I'll forever be grateful for the lessons I learned while working on Twice Upon a Time. I still use them every day on everything I work on here at Pixar," Harley concluded.